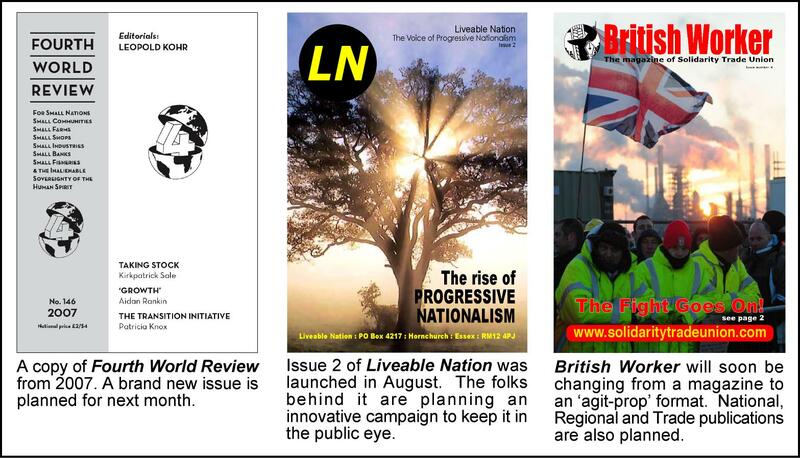 THE Third Way Think Tank understands that the folks behind Liveable Nation – the ‘Newsletter and Think-Tank of Progressive Nationalism’ – will soon be launching an innovative campaign to keep the publication in the public eye. This campaign will consist of e-posters featuring dramatic photographs and artwork. Liveable Nation is produced by a small (but growing) loose network of those who would describe themselves as ‘Progressive Nationalists’ in an effort to distinguish themselves from other forms of nationalism. Whilst they accept that nationalism is very much a ‘broad church’ they view some ‘nationalists’ as being merely an extension of the right-wing of the Conservative Party. These Progressive Nationalists have no time for any form of capitalism – be it the ‘national’ or ‘international’ variety. The National Liberal Party intend to get issue 1 of their ideological publication, New Horizon, out either later this month or early November. (It pays homage to an earlier Liberal National/National Liberal journal, which was published between 1942 – 68.) Initially, it will be published as an e-magazine. The first issue is expected to include articles on Democracy, the Environment, the NHS, the Economy, Civil Liberties, as well as Reviews and much, much more. As with Liveable Nation, we understand that an innovative promotional campaign is being planned to promote New Horizon. The National Liberal Party are also thought to be planning to launch a ‘street publication’ early in the new year. 4WR is the publication founded and edited by John Papworth. It describes itself as being in support of “Small Nations, Small Communities, Small Farms, Small Shops, Small Industries, Small Banks, Small Fisheries, The Inalienable Sovereignty of the Human Spirit”. To complete our round up on news that we’ve heard on the grapevine, we understand that Solidarity Trade Union are planning a street version of British Worker. Currently, it’s produced in a magazine format – in line with its policy of building an “infrastructure of a mass media of news and entertainment” – wish to produce it in ‘agit-prop’ form. The first issue of the new look British Worker (it’ll be the equivalent of a double-sided A4 sheet) will be out next month. It’s understood that a replacement ‘in-depth’ magazine will probably be launched sometime in the future. In the meantime, however, the union’s web-site http://www.solidaritytradeunion.com will carry ‘weightier’ articles about trade union idealogy, stategy, history and law. To get hold of the last magazine format issue of British Worker (issue 4) simply e-mail solidaritygb@aol.com and asking for a free pdf copy.